In preparation for tonight’s episode of Glee, entitled “Theatricality,” be sure to head to iTunes and purchase the two songs Idina will be singing! She peaked at #7 with “I Dreamed a Dream” last week, but I have an inkling that “Poker Face” might crack the Top 5, if not the #1 spot, so make sure you go buy the songs to support her! We shall see what happens! Click the covers below to buy now. Note: Tracks may not be available on all countries’ iTunes at this time. Today we’re launching our first-ever (I think? haha) Idina concert ticket giveaway! The San Francisco Symphony has donated a pair of tickets to its July 9 performance with Idina to Idina-Here.com. Read on for how to win them! 1) What are 3 characters Idina has played (stage, film, or TV)? 2) Who will be conducting the symphony at Idina’s performance on July 9? 3) How long is the Golden Gate Bridge? 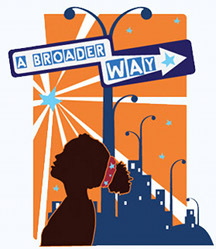 – Deadline to enter is May 31, 2010. Contest is open to everyone of all ages and in all countries. Do not enter if you cannot be in San Francisco, CA on July 9, 2010 on your accord. Limit one (1) entry per person/email address. Multiple entries will be thrown out. Winner will be chosen at random from all correct entries and notified on June 1, 2010. Winner must accept prize within 48 hours by responding to notification e-mail and providing the requested information. If winner does not respond or is unable to attend, another winner will be chosen from the remaining correct entries, and so on, until the prize is accepted. The winner will be announced on this website & Twitter upon confirmed acceptance. Winner will receive two (2) tickets to the July 9, 2010 performance of the San Francisco Symphony with guest vocalist Idina Menzel. Tickets will be held at the venue’s box office as “will call” to be picked up by the winner the night of the performance with valid photo ID. Winner is responsible for providing their own transportation and housing. If you have questions, please do not hesitate to ask them here in the comments. I ask that ALL questions are asked in the comments so that other people may who may have the same questions may read the questions and my answers. Idina trended once again on Twitter, defying their funky new algorithm. She actually hit the trends two different occasions, nationwide during the east coast broadcast and worldwide during the west coast’s! More than 450 screencaps from last night’s episode have been added to the gallery, along with an official promo still. Click the thumbnails below to view! Tomorrow, May 18, marks Idina’s return to Glee! Make sure to set your TiVos and tune in! She has done a few interviews recently to promote her guest spot. Here’s one that was filmed a couple weeks ago for ABC News Radio. Make sure to read AND watch this great one from today’s USA Today. Click the link to read more. On tomorrow’s E! News, they will air their own exclusive interview with her, so make sure you watch for that, too! Don’t worry if you miss it, though. 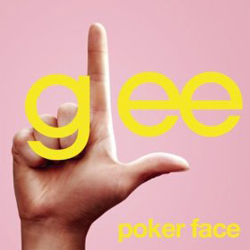 We’ll include it in our Glee 1×19 update later this week. And remember, tomorrow Volume 3 of the Glee soundtrack will be released, including 2 of Idina’s songs! Pre-order on iTunes today. Idina has added a 16th show to her 2010 symphony tour! She will be performing with the Pittsburgh Symphony Orchestra on June 29 at Heinz Hall. Tickets are on sale now! Click to purchase! In Glee news, Target’s website has posted different previews of the Volume 3 soundtrack than were previously released. Visit the album’s page to hear IDINA singing “I Dreamed a Dream” (rather than yesterday’s Lea-only preview). 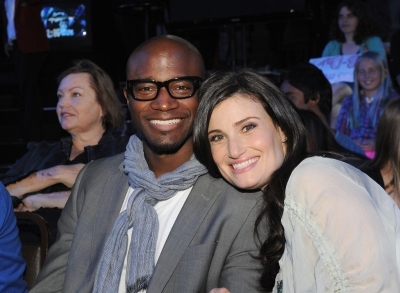 And lastly, Idina & Taye attended this week’s American Idol on performance night. I know a number of you spotted them in the background seated behind Ellen DeGeneres, but here’s a nice photo that was taken at the show. Click on it for HQ.